The Mini Rex has become one of the most popular breed of domestic pet rabbit in the US. Although presently, not as common in the UK, it too, is now becoming one of the more popular breeds. The breed was first recognised by the American Breeders Rabbit Association (ABRA) in 1988. The main feature of the Mini Rex is the very beautiful, plush, velvet like fur coat. The fur is very soft with the hair protruding outwards, rather than lying flat, giving an individual springy feel when touched. The longest guard hairs (the long coarse hairs forming a layer that covers and protects the soft underfur) have been eliminated by selective breeding and the secondary guard hairs have been reduced to the same length as the undercoat hairs. The result is a fine silky texture of fur that is very dense, shiny, smooth and level all over the body. 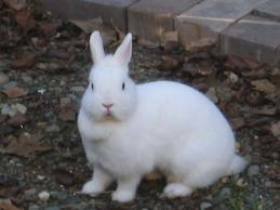 The Mini Rex is one of the more recent breeds of rabbit and originates from the Rex rabbit. The breed is a direct result of the crossing of a Black Dwarf Rex Buck (imported from Holland in 1984 by Mary Louise Cowan of Maine) with an undersized Lynx Rex Doe. 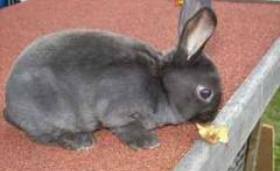 The cross produced the Mini Rex and through selective breeding, the breed was developed. The crossing of a Netherland Dwarf and a Rex was done in Holland by the developer of the Dwarf Rex and was many generations away from having the true Rex fur. 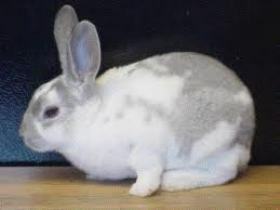 The Mini Rex has a friendly, fun loving and sweet temperament. They are playful and make good pets for children. Adult supervision is necessary for children when handling and caring for any rabbit. Body features are a bold head with the body sloping to well rounded quarters and erect standing ears. The fully grown adult weighs 3.5 to 4.5 lbs (1.58 to 2.04 kg). Bucks may be slightly smaller at 3 to 4.25 lbs (1.36 to 1.92 kg). The life span for this rabbit is up to 10 years, perhaps longer but the life span of any rabbit is dependent on the care and diet given. Broken (any of the above colours broken with white), Tri colours and Pattern. UK colours are 'self' such as Black, Blue, Ermine (off white), Havana (dark brown) Lilac, Shaded, Tan pattern, Agouti and any other colour.